Click on the PDF to view it at a larger size. 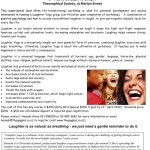 Join us at the Tauranga Yoga Centre for a smorgasborg of yoga workshops tauught by a variety of teachers including Tony ter Ellen, Curly West, Karen Johnston, Brigid Macalister, Christine Terry & Sue Furey, Brigid Macalister and Tania Hanna. Workshops include sessions on the ropes, yoga nidra, restorative yoga and opportunities to go deeper into alignment and transitions. Book for individual workshops, or for the entire weekend. 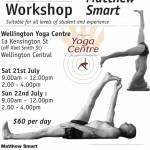 Contact Elizabeth Street for more information, or see Tauranga Yoga Centre’s website. During this three hours we will explore the recurring theme of 'Breath and Alignment' through a variety of asana sequences. Expect to explore backbends and inversions, forward bends and standing postures in more depth.